The report of the Commission on the Roles and Capabilities of the United States Intelligence Community , "Preparing for the 21st Century: An App raisal of U.S. Intelligence," was released on March 1, 1996. The Commission nonetheless believes the staff's review demonstrated that reductions to the existing and planned intelligence resources may be possible without damaging the nation's security.... the Commission believes cost savings can be achi eved if the Intelligence Community adopts the management practices and implements the cooperative arrangements summarized earlier in this chapter. Those actions, together with pruning unnecessary requirements and unproductive systems and activities, could free significant resources. The Report also recommended official acknowledgement of the overall $28 billion intelligence budget, though it concluded that the budgets of individual agencies should remain unacknowledged. But the report itself discloses the budgets and personnel levels of several intelligence agencies. Apparently it is permitted for the foreign adversaries [and the public] to know this information, as long as the government is not required to officially acknowledge the fact that the public has this information, or to engage in a dialog with the taxpayers as to how their money is being spent. After weighing the arguments, the Commission concludes that the President should disclose to the public the overall figure for the intelligence budget. The Commission believes this can be done in manner that does not raise a significant security concern. While disclosure would necessarily convey limited information, it would let the American public know what is being spent on intelligence as a proportion of federal spending. This in itself is a worthwhile purpose, and may, to some degre e, help restore the confidence of the American people in the intelligence function. A number of foreign governments, including the British and Australian, have disclosed their intelligence budgets to the public without adverse effect. The Commission belie ves it can be done here as well. 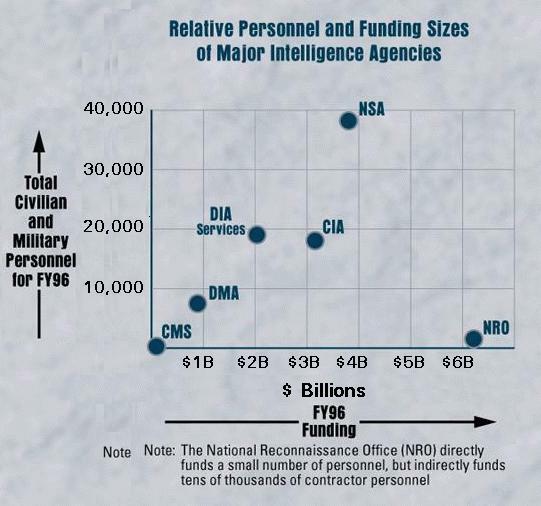 Although intelligence funding remains classified, Figure 2 depicts the relative funding levels of the major intelligence agencies and their personnel levels for FY 1996. 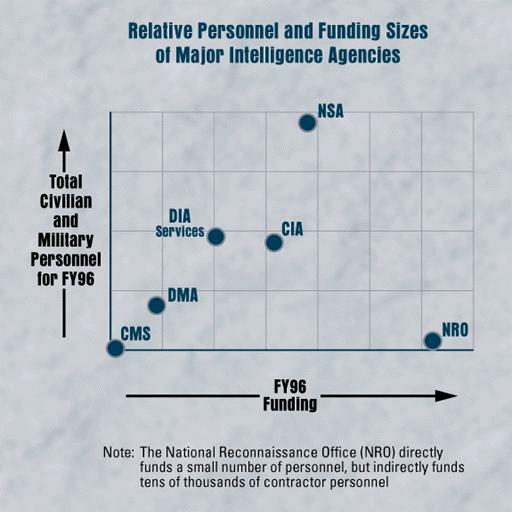 NSA, CIA, and DIA (and the Service intelligence units) have the largest n umber of personnel; the NRO, on the other hand, has the highest level of funding of any program in the Community, but virtually no federal workforce. Its work is accomplished primarily by contractors in the private sector. DMA operates under a total annual budget appropriation of some $826 million (Fiscal Year 1995).... DMA's work force includes approximately 7,100 civilians and 260 military personnel. This permits ready callibration of the X and Y coordinates of this graph. The Community Management staff and budget are both quite small -- annual budget appropriations have been public for some time, most recently $90.7 million for FY96 with a staff of 247 full time staff. As is well known, CIA's budget is about $3.1 - $3.2 billion, with over 17,000 personnel. The NRO budget is somewhat in excess of $6 billion, with somewhat over 1,000 on staff. 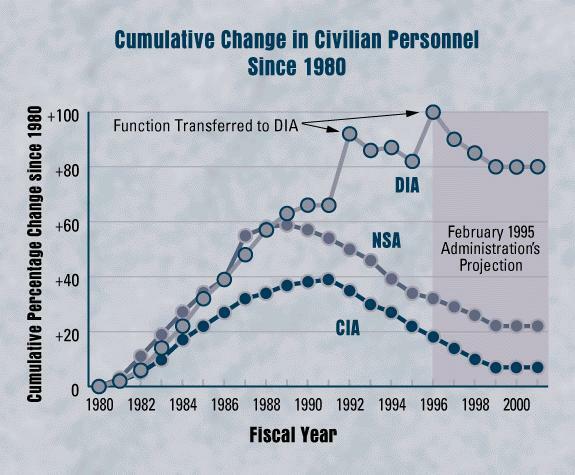 The NSA budget is around $3.6 billion, about what is indicated on the chart, though the roughly 20,000 direct-hire NSA staff are augmented on this chart by nearly as many uniformed personnel from the Army, Navy and Air Force components of the Central Security Service. In an interesting insight on accounting of the Consolidated Cryptology Program, NSA counts the CSS personnel, but not the budget authority to pay them, which, as with other Defense Agencies, is carried in the budgets of the military serv ices. 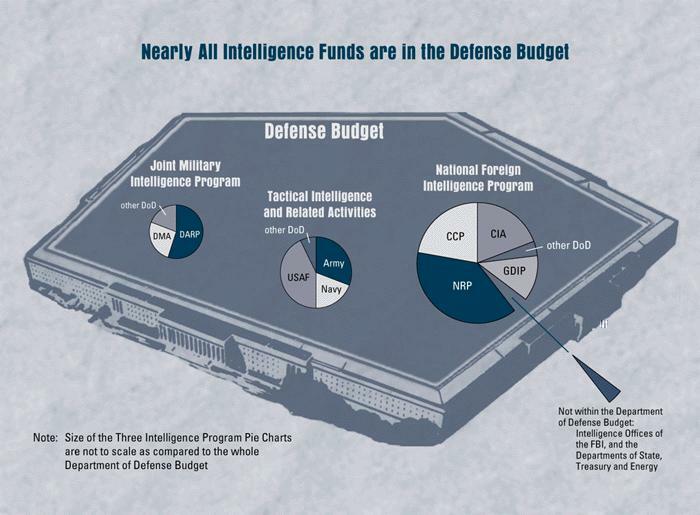 Similarly, the $600 million budget and 8,500 employees of the Defense Intelligence Agency are augmented in this chart by the General Defense Intelligence Program [GDIP] personnel and budgets of the Ground, Maritime and Air Intelligence Centers of the military services, which together are almost twice as large as DIA itself. Based on the prior analysis of Figure 13-2, it is also possible to fill in a few blanks on this chart as well. This figure is a first cut analysis, and will need a bit of subsequent refinement which may alter the numbers [particularly TIARA] a bit, but th is gives the general idea. The Service TIARA budgets include both the budgets of the Service intelligence agencies, as well as other TIARA activities conducted by other Service components. Table 7-1: Increasing Budget Formulation Responsibilty for NFIP Program Managers in each of the Intelligence Disciplines. Notes: Two proposed program managers--the Director, National Imagery and Mapping Agency and the Deputy DCI for CIA--are positions which do not currently exist, but have been endorsed by the Commission. The 3% figure, associated with imagery intelligence, refers to funds currently budgeted by the Director, CIO. The 96% figure, associated with clandestine human intelligence, refers to funds currently budgeted by the Executive Director, CIA. These results are rather preliminary, and will need some refinement, but they interesting to contemplate nonetheless. FAS Improved Table 7-1: Budget Formulation Responsibilty for NFIP Program Managers in each of the Intelligence Disciplines. The $0.13 figure, associated with imagery intelligence, refers to funds currently budgeted by the Director, CIO. The $4.3 B would include both DMA, and a significant fraction of NRO. 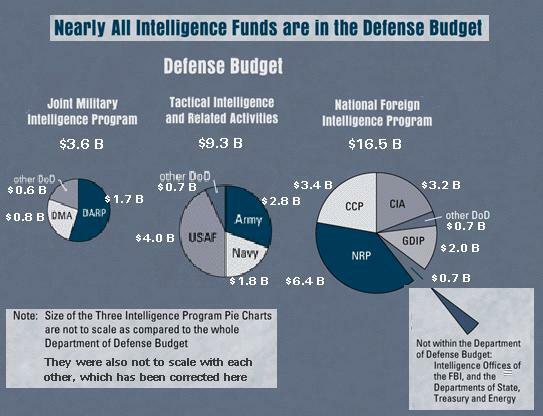 The SIGINT figures suggest that only about half of NSA's budget is SIGINT, with the remainder COMSEC. It is not clear which agencies would account for the other half of the SIGINT program. The total MASINT budget is unknown, though it is believed to be small, of the order of a few hundred million dollars, or thereabouts. The clandestine human intelligence figures are rough estimates, with about 5,000 Clandestine Service personnel at CIA, and about 200 clandestine collection personnel out of the total of about 1,000 in the Defense HUMINT Service. Taking all this analysis into account, it is also possible to reverse engineer another graph in the report, covering trends in personnel levels. The Report's Figure 9-2 includes percentage changes in personnel levels from 1980 through 2001. The Commission is correct in concluding that the intelligence budget can be reduced. It errs in suggesting that agency budgets remain unacknowledged.